Quick! What’s changed on the Library’s home page for Spring 2014? If you answered: “A new Research@UWW tab and search box,” you’re right!! Give yourself a gold star! Don’t worry, it’s ok if you didn’t notice–it’s the first day of school, for goodness’ sake–but this new resource may figure prominently in your spring semester research. 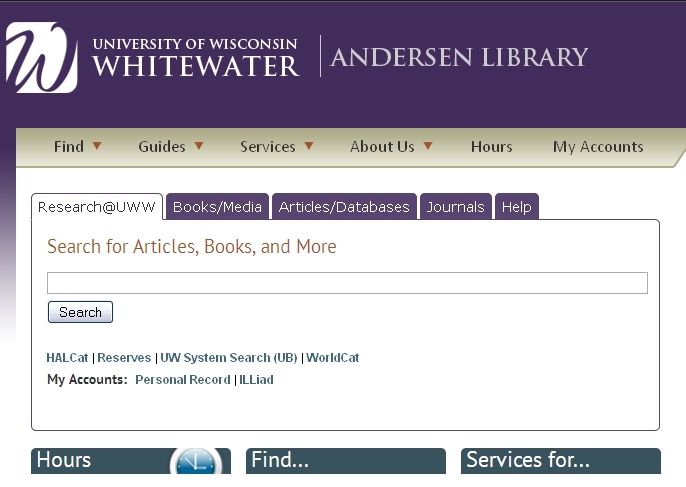 Research@UWW is a discovery tool that allows you to search for books in this library, books in other UW libraries, articles in many of our library databases, and items in digital repositories–all at the same time. Or you can choose to search for them separately, it’s up to you. If you type in a search in the Research@UWW search box on the Library’s home page, you’ll automatically be searching “Everything.” On the left side of your results list, you can use the search facets to refine your results: by resource type, subject, date, and more. Once inside Research@UWW, you can choose to change the scope of your search via the dropdown menu next to the search box. Instead of searching everything, you can narrow your search to, e.g., just HALCat (the library’s online catalog), just articles, or just UW System library catalogs. In addition to books, Research@UWW searches for articles and citations found in the Library’s article databases. It replaces SuperSearch, which was retired at the end of last semester. However, since not all of the Library’s databases are searched by Research@UWW, it’s not a replacement for searching the individual databases. For a list of databases that are not included in this new resource, see our Research@UWW online guide. For a list of all of the Library’s databases available for individual searching, see our Articles & Databases web page. Take some time and explore Research@UWW! If you have questions, ask a reference librarian! This entry was posted in featured resource and tagged articles, books, databases, online resources, research. Bookmark the permalink.